Why does America have an obesity epidemic? What does the rest of the world think about what is going on in our country? Does everyone have the same perspective? We agree that sedentary lifestyle combined with the abundance of fast and processed foods are a huge factor in the health of our country. But as an outsider looking in, what does everyone else think? Find a news article published outside of the United States that talks about our situation. What perspective do others bring? Make sure to include the link to the article you discuss. If you are posting from somewhere other than Texas, tell us what you think. Let us know where you are posting from! **Since we want to discuss a large range of perspectives, read previous posts before selecting your article to ensure there are no repeats. In this article, Hispanics reveal their opinions on the American obesity epidemic. They do their research and came up with percentages for each state stating how obese they are in each state. They even predict for each state how much obesity will be in each state (percentage-wise) in roughly 15-20 years. Family history causes obesity as the size of parents and the amount of exercise they do directly impacts on their children. For example, if the parents are lazy, so will their children. If parents participate in sport or regular exercise the children will also have an interest. This also relates to diabetes and other obesity related diseases. The same is true of portion sizes. American portion sizes are enormous compared to NZ portion sizes. I think that you made a very valid point about how a parent's lifestyle directly influences his child's- in other words, a parent's healthy and/or unhealthy habits are often passed down to their offspring. Nevertheless, I don't necessarily agree that all Americans are lazy, but rather work-oriented, when we should be workout-oriented. I think that it is safe to say that the majority of American jobs involve sitting behind a desk from 9 am until 5 pm. And by the time that they get home, they are tired and choose to eat a nice dinner and relax after a stressful day at work instead of rushing off to the gym or going on a nice walk. This daily routine is dangerous to health considering it allows for very minimal calorie burning and a lot of calorie intake. I agree with you when you say that depending on the example your parents set directly effects what you do. If the parents set a good example of a healthy lifestyle, their child will be more likely to follow in their footsteps and make healthier choices. However, I also believe that one can learn from their parents' mistakes and see how living an unhealthy lifestyle has caused them trouble therefore they will be more likely to make adjustments to prevent having the same problems. Lastly, I agree that Americans have a much larger portion size which does in fact add to our obesity epidemic and needs to definitely be changed. Typically a parents life style will directly influence their children's attitude towards exercise and diet. A parent that is knowledgeable about health and nutrition will teach their children the importance of living a healthy lifestyle. It is important to be informed so that you can make healthy choices regarding your health. Children are very aware at such a young age that they copy what their own parents do. I think parents should get more involved in their own children's health style lives and show them a positive influence. I think teenage American generation today is in the most trouble, because they have had more time to adapt to the fast life (i.e. fast food) and that they don't know what it's like to have a well balanced meal. I very well much agree to your post that young american's lives are more endangered with childhood obesity. Food is cheap with many options. Too many McDonalds and like fast food restaurants. This lobby is too powerful for the common sense approach to food production and preparation. This is so true. We really do have a lot of access to cheap, unhealthy food. Its easier for us with our fast going life style. Do you all have fast food restaurants thats are easily accessable? This can be true at some places, but their is options of eating healthier food, but it can cost more money and take more time. It can sometimes be hard for some Americans that work many hours throughout the day to find time in their day to cook, therefor restaurants such as McDonalds are convenient for some Americans. This is true. It it widely known that the convenience of of fast and cheap food is a big reason of the obesity problem that occurs in the United States of America. Of course, there are many healthy options for Americans, but it is difficult for one to arrange time to make a healthy meal. Also, the daily chaotic lifestyle of many Americans is a factor that contributes to the obesity epidemic. Obesity rates in the US in my opinion are high due to a lack of inherent discipline and education infused with convenience and availability of cheap fast food. There is also the conviction of obese individuals as being images of unhealthy and ill disciplines, a contradiction in itself. Depressive patterns and inactivity attributes from this, causing the dependency on such foods. Fast food is easy to find, but it is not cheap compared to eating foods at home purchased from a store. Also, fast food tastes good. People are not dependent on fast foods, they just like to eat them. The real problem is a lack of exercise. Plenty of Americans are disciplined. Sports are very popular here. From our point of view, we see that our school is fairly healthy and active with sports and other extra cirricular activities. What is it you see that your school does to stay healthy? It is true that we do have a lack of education on how eating affects our health. But a lack of self discipline is not the only problem. Many of us do sports and do exercise on a regular basis, as well as eating healthy. Sometimes we also inherit health problems from previous generations; our parents. How do you feel on health problems due to genetics? How do you approach the topic of obesity in your country? Do you still eat out or prepare more meals at the house? How do you stay away from all the fast food and have the discipline to stay healthy? is difficult to achieve and isn’t considered a priority over other things, e.g. income targets. Although I certainly agree with your argument, fast food is readily available and cheap in other countries too. Therefore, the problem does indeed come down to a lack of time. It is imperative that Americans find time to make fresh food and exercise. I believe, however, that this problem goes well beyond the scope of America. Other countries also deal with this issue and it should be resolved. I agree with you. It seems like more healthy food and organic food cost more than the unhealthy food. People are too lazy to cook something themselves and do not want to go get food from the grocery store, they would much rather drive to a Mcdonald's and pick something off the dollar menu everyday. This is true, as Americans we aren't limited to what kind of food we want or how much we want. Things come fast to us, and we aren't willing to wait and be patient, especially for food. We are a fast paced nation always looking forward, and it's seen as an inconvenience to spend more time and money on healthier food. My group agrees that the fast food is cheap because they use chemicals and other treatments to make the food process faster. We think that their should be a way to make healthier food cheaper but the problem is time. The healthy food takes longer to grow. How would you solve the problem and make healthier food cheaper? What kinds of food do you eat and is it expensive? What advice would you give Americans to live a healthier life style in our country today? IN this American society the job industry is one that is very fast paced and competitive. Due to this for of culture, the American adult might find himself working an extraneous number of hours just to keep their jobs and to support their family. Because of these circumstances it is easy to understand why people do not have the time to worry about their health and spend enough time to prepare a healthy meal for themselves. Our group agrees with you that the accessibility to fast food is very fast. It contributes to the issue that Americans are just now realizing, but still continue to follow their paths down unhealthy eating. It is true that the reason most Americans are obese is because they need access to fast food...hence the name FAST food. It is very important that we find a way to make more fast food accessible that is healthier and can help Americans live healthier lives. We as a nation, need to figure out how to combat this ongoing problem we have been raised on. What are some suggestions you can give us Americans to live healthier lifestyles, and stick to it? America is seen as a country full of people with busy, work-oriented lives with little free time. This combined with the abundance and accessibility of fatty convenience fast food has created a culture relying on such foods imply for their convenience. The scale of the fast food business and the amount of money and political support makes it difficult to reduce their influence on the America food culture. Combined with the marketing skill they employ, the fast food industry has created a culture accepting obesity and little hope of reversal unless major legislative change is made. We don't disagree with anything you're saying. You pointed out a lot of important things that we didn't realize. We agree with your post. I know as for me my family has a very busy extra curricular schedule with my two younger brothers and I. Sometimes after a long day and baseball practice, Sonic or McDonalds is just the quick and easy way out. Everyone is too tired to cook a meal but that should be changed with discipline which is also a quality most Americans are lacking. I agree with you. I think one of our biggest problems is our healthy is not our main priority. Instead, we focus on work, family, and social lives. When it comes to food, convenience is what we look for because we fill our schedules to the brim, not allowing us time to prepare healthy food. We know that this is a poor excuse, but in the moment we are looking for efficiency. Another problem is we are presented with more unhealthy options than healthy options and fast food can be addicting. But we have a question for you. What does your country do differently? Y'all obviously have a different culture that views health expectations differently. Also, what type of food does your country promote and how is your government taking initiative in your societies health? I very much agree with you. We put so many things before personal health that at the end of the day when we've gotten all of our self made priorities done, we have forgotten about the priorities that we shouldn't even need to think about so we rush to get it done, and when we get in a rush fast food becomes the easiest option. For some, this is a daily occurrence which can, and does lead to obesity. What does the rest of the world think about what is going on in our country? Does everyone have the same perspective? America has an obesity epicdemic because it is so easy for kids to avoid exercise and eating healthy. Many kids, especially those in lower socioeconomic classes, don't have access to gyms that require memberships or well-maintained public parks and sidewalks to exercise. Healthy eating can also be expensive and may not be a priority for families who have a low income. The French study I looked at (link below) showed that the high rate of obesity just contributed to Anti-American sentiments in other countries. Americans are considered to be tasteless and classless, with the rising obesity rate symbolizing the decline of our culture. I think it is hard for us as Americans to understand what exactly a "work-oriented life" is not. This is all we have known, to go go go all of the time. The main source of our over eating is also affecting how we interact with our families. How we instruct eachother and how we implement this "discipline". I bet that eating well is connected with how we interact with our families. If we cannot make time for family, then other aspects of our lives that are needed we may ignore as well. How do people in your country balance work, family, and eating right? I think that we could learn a few things. But right now, to me, it feels impossible to get the "healthy" amount of each in every day. I do not know much about New Zealand, but here healthy food is more expensive. SOME of this is not our fault, but a lot of it has to do with discipline. I agree with that. We also need to consider that school cafeterias do not offer the healthiest choices. Sometimes the salads will mold. It is difficult to trust anything here that is sold in every store. We can choose to eat smaller portions, but sometimes even those portions are not helpful to our bodies. I completely agree, I think it's sad that pizza can now be called a vegetable in schools. Obesity has become such a quickly growing epidemic partly because of the availability and handiness of fast food, partly because of the lack of knowledge on the origins and content of food, and partly because we are starting bad habits and food preferences at such an early age. From the time American children enter the 1st grade they're severed a cafeteria lunch 5 days a week 9 months out of the year, for the next 12 years of your life. It's true that bringing your own lunch is an option, but there is still the issue of time and money. I know America has been working to improve food in school cafeterias over the past years but in my opinion calling pizza a vegetable is in no way helpful. Most food served in cafeterias is high in sodium, preservatives, and fat; with meats that certainly don't come from grass fed animals. Just as some of the other commits said children learn health from their parents who probably learned it from their parents, so it seems nothing but logical to start the next generation out on the right foot. What better way to do that then in school? Getting in healthy habits from the start will create a whole new generation of informed Americans who can go on to help break the cycle of obesity that’s taking over. From this article, it looks to me like obesity is an international epidemic, but arguably more so in America. The UN is recognizing it among the coalition of countries. medical officer, had told the board. We believe obesity in America is a huge problem because of two main contributors: • the cultural lifestyle -- including amount of exercise required within the physical environment; and upbringing including attitudes toward food and exercise. • the commercial side of the food industry – including availability (food is everywhere, fast and cheap); advertising (targeting) and addictive ingredients. We believe you're right. Fast food, as we call it, isn't just fast, it's everywhere. Ironically, we're motivated by our laziness to just stop and get something to eat without even having to leave our cars because of the drive-thrus that accompany nearly every fast food restaurant. On the other hand, there are plenty of Americans that don't eat a lot of fast food, and prefer to cook their own meals. And as for the amount of exercise that our environment requires, you're also right. We drive everywhere, and when we're not driving we're being driven. We couldn't agree with you more, especially with your first point. We have been brought up in a culture that is taught that it's okay to be ignorant of what is put into our bodies and that needs to change. It is undeniable that obesity is prevalent in the United States. America has the highest obesity rates in the world. However this is determined by location and lifestyle. The southern states in America tend to be heavier because of the diet of fried foods while the West Coast has healthier and more organic food choices. Just within our community there are hundreds of fast food restaurants but it is also a very active environment. Sports dominate the area and there are many opportunities to go out and be active. I do not feel that our community is plagued by obesity and addiction to fast food. However advertisements and the availability of fast and cheap food is higher and quite convincing at times. DO not be deceived though, the country as a whole may have high rates but they are typically in more concentrated areas. We completely agree with you. There is a lackadaisical approach to exercise and overall health that increases the obesity in America. Kids are not encouraged to stay active as much as they should, often allowed to watch television or surf the internet for extended periods of time rather than going outside to be active and stay fit. Additionally, as you mentioned, fast food is readily available. We have quick drive-through restaurants on every street corner that serve as a convenient meal for the average rushed American. This food is extremely unhealthy and full of harmful chemicals that only increase obesity levels. Americans feel it is their right to decide what to eat and how much to eat, and often enough moderation is not taken into account; e.g. a person can drink 1 litre of Coke but doesn’t consider whether or not he/she should have drunk the ingredients in that Coke. I agree with you and we do have the right to decide what we want to eat and how much we want to. It is not the government's job to regulate what we eat. However a culture change does need to occur because obesity is a huge problem in America. That is very true. Many people who do eat fast foods, sodas, or other forms of junk food do not pay attention to the ingredients. If people did pay attention to the ingredients, many don't even know what some of the ingredients are. Those who do consume junk food do not realize they are intaking chemicals and unhealthy substances to enhance the food. Its true in America that we do get to choose what we want to consume and eat how much food we want. It is a national problem that we all realize is there, but not everyone eats unhealthy amounts of food. It mainly is the amount of individuals who consume so many products without taking the consideration of portion control. There are a lot of people in America that live healthy lifestyles and balance their diets. We think that alcohol consumption or addictions in general plays a large role or contribution to obesity in America. We know that in Europe, alcohol consumption is an activity implemented by the families, and there are some claims that this is the reason why europe "drinks more responsibily." Here is an article that talks a little bit about that. Soda,junk food, and fast food is also available in New Zealand so what do you believe is the difference between the two countries? Is the fast food as cheap, and the people more health conscious? I agree with what you are saying, there have been many times when I drink a coke just because it tastes good, and I do not look at the consequences that could occur after consuming this beverage. I think alot of the problem with obesity is that America is uneducated on what they are eating. There are so many hidden toxins and ingredients in food now a days, that we do not realize the reprocussions from consuming them until it is too late. We believe that obesity is a problem in the USA due to the lack of restrictions on fast foods, poor cafeteria lunch quality and lack of fitness or daily activities that would greatly increase energy expenditure. I think your point on the restrictions on fast food is great. For us, we have fast food restaurants on nearly every corner and the food is incredibly cheap and, as assumed, the food is given to the customer fast. How does your government restrict fast food? Are there a lot of fast food restaurants where you live? Freedom from restrictions on consumer goods is part of our country's heritage. One of the prime ideologies that keeps our markets and private industries free from government control and intervention is capitalism. We believe that it is our right as citizens to decide what to put in our bodies and buy what we choose. I see your point about the restrictions, but businesses have the right to manage it as they see best. However, instead of finding the cheapest ingredients possible, it would be great if they focused on quality instead. They are supposed to cater to us, so unless we demand better ingredients, they will keep providing cheap ones, but nothing will change if everyone keeps eating it. Our cafeteria options aren't too bad because the government tries to make sure that we have decent options at school, and it's up to the students to resist the unhealthy foods. The lack of exercise is a problem though, since not everyone can fit it in their lives. How do you fit exercise in your life? How often do you eat outside of your home? What does your cafeteria provide? I completely agree with what you're saying about restrictions. I feel like Americans are so caught up in consumerism and making money that they don't really care about their health all that much. In New Zealand, what types of food do you eat and what restrictions do you have? Are there different genres of food and what types of fast foods do you have? What does your typical diet consist of? Our group agrees that there aren't really any restrictions on what a person eats and often people feel like it isn't there place to tell another how much they should eat. Do you think people need to step in and place restrictions or guidelines in schools for serving sizes? Have you heard of the 16 oz soda limit in New York City? do you feel like this would be a good or bad thing to implement? The obesity problem isn't due to a lack of work ethic, its just that the highest paying jobs are jobs that require long periods of sitting, at desk and computers etc. I agree that Americans lead dangerously sedentary lifestyles usually, and the problem is getting worse due to fast food and other such factors. How would you fix this problem? I think a lot of the problem is that people don't necessarily think about what they eat before eating it )we want what is fast and easy due to our hectic lifestyles)and this may be because of education. In elementary school, for example, you made be told to eat fruits and vegetables and exercise without learning the long term impact of these good habits. Another reason could be our culture/history. I think the idea of mass production was implanted in our history early on when the Europeans settled the Americas, creating large plantations of tobacco, sugar, corn etc. As for culture, other countries' diets differ. For example, in the South East Asian countries, a lot of people don't eat meat so their diets consist of a lot of vegetables, nuts, wheat, etc. In East Asian countries, diets consist of a lot of seafood whereas, in the U.S. red meat is consumed on a fairly large scale. I think the main issue is access. There is absolutely no restriction to fast food everything is around the corner and occurs more than once in a single city, and the fact that almost all fast food restaurants are open 24 hours a day does not help. That just enables people to turn their midnight snacks into midnight destructions. Obesity definitely stimulates America's way of everything being fast, convenient, and reliable. Living the New Zealand lifestyle and observing America's lifestyle, what changes do you suggest that America make? America does have an obesity epidemic especially when studies now show that one in three people this nation is considered overweight. This British article attributes much of America's obesity epidemic to the availability and accessibility of fats containing high levels of fat and sugar. They believe this relates back to a major diet change which dates back to the 1970s when the US began the mass production of high-fructose corn syrup which allowed for massive quantities of food to be made much cheaper. This made a lot more foods with high fat content more accessible than ever. The Brits believe that Americans have carried those diet changes made in the 70s into our modern diets which coupled with a sedentary lifestyle results in weight gain, and in the US's case this continues to occur at a staggering rate. Reading this article not only was I only able to see what other countries think about the US, but it also provides a less bias perspective which doesn't attempt to sugar coat the facts. America is currently experiencing an obesity epidemic due to individuals eating habits, lack of exercise, and portion control in their diet. From outside views of the rest of the world, they think that American's are lazy and try to dominate other countries. Most countries pretty much have the same perception because they observe what America does with other countries. In an article from Spain, they seem to think that the cause of obesity is not by socioeconomic groups, but affects all people equally across the board, whether they are rich or poor. The article also believes that an effect of the rise on obesity is the economic and technological development, which influences the choices individuals make with their diet and physical activity. When I read this article, it allowed me to view and confirm the thought that I had about what other countries, such as Spain thought of Americans. This articles was published in the middle east in October of 2012. The article discusses how the United States is #1 in the world in child obesity and Mexico is ranked #2 in the world in child obesity. In the article it discusses the abundance of cheap food in both Mexico and the United States, In Mexico there are an abundant amount of street vendors that sell five greasy tacos just for a dollar. And in the United States there are even more opportunities for little kids to purchase junk food such as ice cream trucks, food trucks, and food vendors. The problem with American child obesity is the lack of self control and reliance on sodas and fried food and children are exposed to sodas and fried foods at such an early age they become dependent on it and can't stop eating it and the problem is just as bad for Mexico. As an American, I’ve seen firsthand the multiple factors which influence the US obesity epidemic. Whether it’s through the convenience and low costs of unhealthy foods or lack exercise- much of these practices are promoted by the fact that many Americans have really been unaware. Education has always been a key to the US for its limitless ability to speak words of change and make people more conscientious of the world around them and how it affects them. However, I feel as though one of the most important aspects of human awareness is not being approached through means of “all-powerful” education- our very own health and nutrition. Sure we require students of our educational system here in Texas to complete certain physical education classes to graduate… but really? I don’t call playing Ping-Pong all semester even close to the physical education American adolescents need. And apart from the students who do involve themselves in these, so called, ‘physical activities’ there is always a large portion of the class that sits on the gym bleachers who are never expected to do a thing and yet still received an A for solely dressing out into their uniforms every day; so why would students put in the extra effort anyway? This is where the actual educational portion of this class needs to step in. At a young age, kids should grasp the meaning of and seek a healthy lifestyle with good nutrition and exercise not just because it’s named ‘healthy’ (which generally the word would scare the daylights out of any child between 2 and 12), but because they want to by knowledge of real life facts and proven benefits. Much of the time, this kind of information is hidden from the public eye- kept confidential to the scientists and doctors and would have to be researched and found on some university study report, not even comprehendible to the average American citizen- much less kids. It’s sad to realize that I’d never been fully aware of the recommended amount of fruits, vegetables, and proteins needed to properly function- I’d never been concerned to know before- at least, not until the past few months of my Anatomy and Physiology class. Unfortunately, many American high schools are nowhere near as lucky as Coppell ISD with its specialized programs and in depth look at health. Shouldn’t this kind of vital information be more than just available to all, but become infused into basic education of youth across the US? Only in recent years has the US Government really started to support the battle against obesity; especially marked by Michelle Obama’s “Let’s Move!” campaign, where children are being educated about fun ways to stay fit, eat healthier foods, and what the daily recommended amounts are. Even the “My Plate” diagram has helped to put those complicated numbers and counts into an easier perspective. Only time will tell if the current generations will rise up to inform the next generations about the basics of their bodies and health they deserve to know without having to go through ½ of their lives, end up with diabetes, and then become enlightened by the facts. Health (eating and exercise) practices are set at a young age and have influence on the rest of our days-the sooner we learn the better. In this article, written by Dr. Raymond Schaus of Luxemburg, France, obesity is thought be linked to excess calorie intake from manipulation of the food industries. He explains walking into the Wal-Mart and Walgreens to see what kinds of products and goods we consume- which to his country are extremely packed with extra calories and addictive additives shown right on the nutritional information. He says there are crazy, unrecognizable names of chemicals and totally misleading labels on our foods that would never be found in a French market. He also describes ignorance in our attempts at ‘health’ as well; stating that while we may be choosing items lower in calories and fats, but this doesn’t refute their super sugary content. These kinds of misrepresentations of “health” foods are also being seen in the restaurants which hardly would ever share the ‘true’ nutritional values of their meals to the consumers. America is having obesity epidemic because of people’s busy life and the lifestyle they are living. The main thing that is going on is that people are mostly work oriented,they have a fast life style so they don’t have the time to cook meal and fresh foods instead they pick the alternative they eat in fast food restaurants, which is a lot faster, easier, cheaper. One of the main factor in today’s American society we have wide variety of fast food restaurant available everywhere. Children instead of playing outside and getting into outdoor activities they stay in home and use their computers and watch TV. According to the article http://latino.foxnews.com/latino/health/2012/09/18/obesity-in-america-can-it-get-much-worse-yes-advocacy-group-says/ every state would have rates above 44 percent by that time 2030. It gives us the obesity percentage of the states in 2011 and the prediction of the obesity percentage in 2030. But every one doesn't have the same prospective they think everyone is getting obesity not just the people in the United States they think that is because people are getting less involved in outdoor activities and eating more fast food. Several countries are of the opinion that the main cause of obesity in the US, besides the obvious: fast food and sedentary lifestyle, is the way our children are raised. Most countries are less indulgent and claim their kids and more disciplined. In America, most parents spoil their children, especially by letting them eat what they want, which is invariably what tastes good, and this starts bad habits early. America is having an obesity epidemic because of the lifestyle that the people have in this country. Life in the united states is fast paced and busy, and people these days don't have time to sit down and cook their own meals. This means that people will rely on other places in order to get their food, like restaurants. In order to accommodate to the masses, food companies produce the quickest, cheapest, and easiest to make food. The combination of the three makes for an incredibly unhealthy meal, or as we know it, fast food. This Canadian article attributes a lack of discipline and poorly made foods for the obesity epidemic in the US. It states that people eat too much and work too little. It also says that the foods we eat are filled with refined sugars and other processed materials, which fill us with empty calories. As a Brazilian living in the United States, I hear a lot of opinions from people over there about how obese americans are. My friends always ask me "everybody in your school if fat right?". In this article, Dr Drauzio Varella, a Brazilian physician and scientist, emphasizes the American obesity epidemic. He starts out by saying how in the previous week, when he was visiting the country here in America, he saw so many obese people, like he has never seen before. What errors were committed by our society for so many people to be obese in a country that spends so much in the health industry? The excessive amount of food in restaurants portions for an accessible price is the first idea presented in this article, however he states that is not the main cause of American obesity. Dr Varella talks about the concept, which was established in 1950, that argues that eating red meat was the cause of high cholesterol. Ancel Keis was the first who introduced this hypothesis, and was featured in Times magazine with his study. This idea was then spread throughout the nation in 1984, due to a conference formed by the National Institute of Health, that then told doctors to educate their patients about having a diet poor in red meat and fat, and replace butter for margarine. In his opinion this is what spiraled the obesity epidemic, because then society had to replace that red meat intake, for something else. Eating carbohydrates was society's solution to this problem, which brought obesity upon America. obesity is a major crisis in the United states, but you cant blame the fact that fast food is the cause of it. in my opinion its just mainly over eating, it doesn't matter if its healthy or not if you over eat on the more calories you put in than you burn it will cause you to gain weight but yes its true that processed food and fast food doesn't help but if people learn portion control the obesity rat wouldn't be all that high. America has an obesity epidemic, because our fast paced, fast food society does not promote healthy eating. More so than a lack of encouragement to exercise, we lead lives that don't allow us time to sit down and prepare a healthy homemade meal for the family. In an Australian article, the abundance of anti-obesity campaigns America attempts to implement was criticized, because obesity is not a problem that can be solved with a myriad of campaigns. At least not while we continue to live in a food environment dominated by fast food and sugary drinks. An entire change of mind is needed to have a nationwide effect, and so far, the United States has not made any effective moves. America is fat because of the fast food culture that we're all accustomed to living with. Ask yourself this question, can I walk to a fastfood restaurant from my house? Pretty scary huh? Fast food restaurants are all over the place, but also they're cheap. I can walk into a McDonalds, buy two cheeseburgers, a medium fries, and a drink for around four dollars. Low prices like this are very affordable to lower income families; they can get dinner for their families for only 10 bucks if they buy from a fast food place like McDonalds. The rest of the world probably looks at us in somewhat disgust, but they don't see the whole picture. Fast food is called "fast" for a reason, and America moves at a different pace than most countries. Fast food companies have seen, and taken advantage of the american trait of moving around and being busy all of the time. Until America starts seriously noticing how fast food is affecting our country than there will be no change. America has a very large obesity problem to the easy access to cheap food. Along with the cheap food, it also contains a lot of sugar and very little solid nutrients. I also think that the U.S. struggle with people being overweight is because many people enjoy being inside, watching TV, instead of being outside exercising. In this article it shows how Latino countries look at the U.S. and see how almost half our population is overweight and by the year 2030 more than half our population will be overweight. They also break down the obesity by each state and show the percentages of the people who will be obese in 2030. By looking at the facts, the readers of this article see how the U.S. follows their reputation of being an overweight country. It`s very obvious that America is one of the worst countries when it comes to obesity. When listening to what other countries think about why our obesity levels are so high, it comes down to fast food, junk food, portions and lack of exercise. Growing up in the city people drive everywhere. While in other countries people walk everywhere. I have at least 10 fast food restaurants walking distance from my house. Other countries have markets with fresh foods like meats, fruits and vegetables. Growing up when I went out to eat I was taught to finish the food on my plate. I did`nt learn until much later that they give you about 4 servings so I`m eating 4 times the calories. One of the biggest problems is other countries sit down and eat meals together. I don`t know the last time my family sat down and ate a meal together. The biggest problem people think we have is our easy access to the fast food restaurants. They say we have everything we could need in walking distance, and for such a low price. We have fresh food that bare sold but we choose not to purchase these foods because they're a little bit more expensive than the fast foods. We are also called lethargic because we train ourselves to revolve around tv, computers,and all other hand held/ home technology. We deprive ourselves of exercise and give ourselves the options of all the foods we can eat. America has an obesity epidemic because of its fast, cheap food, large portion sizes, and lack of exercise. Not to mention the easy access of fast food places. An aritcle done by npr.org on America's obesity epidemic stated that "more than 50 percent of the food dollar is spent outside the home now". I think that the rest of the world understands the epidemic in the United States and try to use us as examples to the importance of eating right and staying healthy in their own country. That being said, Forbes stated that people across the globe are increasingly becoming overweight. To my belief I feel that other countries will soon find themselves in the same position that the US is in. Also stating that countries like "China and India have relatively low percentages of overweight adults, 28.9% and 16.0% respectively. But obesity and its potential complications are increasing there at unparalleled speed due to the growth of urban populations and an expanding middle class who can afford richer food in greater quantities than their rural counterparts. In China, for example, the number of obese people has tripled since 1992, the WHO reports." In conclusion, obesity is not just an epidemic in the US but it is now becoming globally and other countries are taking action in order to not put themselves in the United states position. The United States has an obesity problem because we have become a nation that wants everything to be convenient and very cheap. It is a lot easier to run by a fast food joint instead of coming home and cooking after a long day at work and/or school. The rest of the world seems to have a similar thought. The convenience we wish to achieve has caused us to become lazy and selfish, not wanting to exercise or do tasks that would improve our health. Most of the world believes that the main problem lies within the food. They believe that there is too many ingredients that are not beneficial. While many other countries have a lower obesity percentage, they also tend to have less money than the average American does, or they are forced to walk as their form of transportation, giving them exercise and lowering the health risks. These outside perspectives help health officials think about what exactly needs to be done within America and its food companies in order to help improve the lives of American citizens. What perspective do others bring? America has an obesity epidemic because fast food is so readily available to anyone who needs it. It is incredibly convenient to people who live very fast paced lives and can get food very quickly.A lot of other countries think that Americans are completely oblivious to what is going on and that we just sit around on our couches watching TV while eating McDonald's all day. Not all of the countries think that exact same thing but they all think that we have the same problem, and that is we are obese and aren't doing anything to help fight it. It is without a doubt that our country has higher rates of cardiovascular disease, type 2 diabetes and certain cancers because of all the fast food restaurants and not going out to exercise to burn off all the fat. The biggest point that foreign countries make about why American is as obese as it is is the food availability. Americans see faster as better, and that's why fast food is so easy to come by. They also talk about restaurants and how often we eat out. Since we don't cook our own food, we don't truly know what goes inside or how big the portions are. The portion size is the biggest difference between American food culture and the food culture of the Australians (in article). What we see as a meal for ourselves, a foreigner will see as a meal for a family. The Sydney Morning Herald discusses restrictions on what a person can order at a restaurant. These healthy eating laws though do not look promising with states like Mississippi saying that they already do enough. The obesity epidemic occurring in the United States is forced by numerous factors in our unhealthy lifestyle. In every corner, there is some sort of fast food restaurant located. In schools, we have soda machines and candy machines to boost the obesity problems. Fast food restaurants are a cheap and easy way to fulfill daily meals of many Americans. There is the perspective in head "why cook when I can just go and grab something to eat quickly?". This laziness is affecting the health of many Americans, ultimately leading to problems such as obesity. This article in the Latino Fox News divides up the data by state of how many percent of Americans are obese. It is stated the health issues and it projects the rate to increase because of the unhealthy lifestyle. It is obvious that America is one of the most unhealthy nations in the world. America has an obesity epidemic because there is so many places to eat out with in a shor distance. On top of unhealthy eating, many are not active and like to sit around with little exercise. Even when people go out to places that are very close by, they will resort to taking a car instead of walking. Things like this contribute to the obesity epidemic. Many countries around the world have this same mindset about America. For example, in an article from Ireland, they believe that we sit around, play video games, and that "everybody's eating poorly." They even go as far to say that we have influence on our pets and that they to are overweight and sit around just like we do. Many of these viewpoints are true as many Americans do tend to sit around and eat very poorly. While everything is so convenient and close, Americans still choose to go to thoes places in their car instead of walking a short distance. All of these small things contribute to the obesity epidemic in America and many others around the world have this same mindset. America has an obesity issue because of how many unhealthy, cheap food options we have at our finger tips. To go along with how unhealthy the food is, the portion sizes continue to get larger. With more food for one meal, people in America are learning to intake more and more which leads to a very unhealthy diet. Also, in America, not many families have dinner at the table every night, without t.v. Instead, we eat in front of the t.v. which is where most Americans spend most of their day. Thus also resulting in fat build up in our bodies leading to obesity. Other countries could give input on what they do and how they eat just to change our habits because they are obviously doing better than we are. Change just needs to be made in America because we have gotten out of hand. America is known for their extreme obesity epidemic. This is because of our laziness and wanting to do everything fast. Many find it much easier to go through the drive thru at a fast food restaurant rather than making a homemade meal, fully disregarding the nutritional value. Not only is America lazy, but we also have much bigger portion sizes. We are often served an excess amount which causes us to eat more than necessary. When looking at other countries viewpoints on America's obesity epidemic I found that most of them agree that it is our own fault, such as laziness. However, an article from New Zealand explains how obesity starts at a young age and is directly affected by the meals provided from the cafeteria at schools. The article goes in to detail about an elementary school in Massachusetts that had the highest percentage of obesity. They would serve french fries and non nutritional foods, which was out of the kids' control. The school finally acted on it and changed the meals to fruits and vegetables making it much healthier. Not only did the administrators change the meals but also added parks to enforce more activity. After this radical change, they saw a decline in the obesity of the kids. This explains that its crucial to target kids at a young age in order to ensure the obesity rate doesn't increase. America has an obesity problem. Most people are lazy, cheap, and want something quick, so they will go to fast food restaurants. It is so much easier to have food made for you rather than making a meal at home. Especially in Texas, every portion of food is bigger. People do not understand how much food they are eating, they just eat what is in front of them. I think if Americans knew what they were eating in fast food meals they would eat less of it. Most people who are over weight belong to the lower class. Since they don't have much money they go to fast food restaurants because they are cheaper than nice restaurants and from the grocery store. These people see that they get fat, but do not do anything about it. I think it's because they get depressed seeing themselves get fat, but only eat to make themselves "feel better." An article published in New Zealand talked about how the mayor of New York is trying to ban super size soft drinks. They were very impressed with his drive to make New York more healthy. Even though the mayor's law didn't pass, it still shows how someone is trying to make a difference. 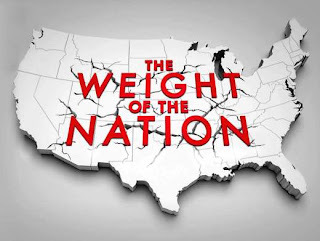 Yes there are a lot of overweight people in America, but is it America's fault. No. To blame everyone's obesity on America's infrastructure and all the different fast food chains is wrong. Although our FDA is not as strict as other countries or our fast food is not as natural as other countries does not mean people can blame it on America. Being overweight is a personal choice. Granted some people have bad genetics, but everyone can choose to eat healthy or they can eat junk. Also people can choose to workout and stay in shape or they can choose not too. My point being, healthiness is a choice that all American's have sadly most people choose to be lazy and overweight. The recent obesity epidemic throughout the Untied States has not just gained national attention, but global recognition. Our bad habits, cheap food, and lazy attitudes are influencing what kind of image the country as a whole is projecting to other countries around the world. Countries such as England, Greece, and New Zealand are taking notice to this deadly and ultimately preventable outburst that is sweeping across the nation. Many of those countries point fingers at the fast food chains like McDonalds for making cheap and extremely unhealthy foods for their costumers to buy, but in reality, it is our fault as consumers for being willing to purchase the low quality food. Though it is evident that there is a strong correlation between obesity and fast food, Americans still wait in line to order a Big Mac and a large fry knowing that what they are consuming is detrimental to their body. Overall, if America wants to change their image to a healthy, lean nation, then it will have to change from the inside out. Americans will have to take a stand against fast food chains and choose to make healthier decisions. Also, another key component that is lacking in the minds if Americans is knowledge. If people knew exactly what they were eating and how it affected their body, maybe they would think twice before they placed their order for a Big Mac. But until people know the consequences that are associated with their actions, I think that America will continue to be viewed as a country that is know for its bad habits, cheap food, and lazy citizens. America does have an obesity epidemic because of the combination of increasingly fatty foods with the lack of fitness because of our sedentary lifestyle. Not everyone has the same perspective of the health of America, as there are definitely extreme of both ends here. However, it is becoming more and more prevalent and being seen as the norm to be obese as an American, and I believe it is a trending stereotype towards us among other countries. Other countries believe everything in America is larger and it is very true in most cases. Our serving sizes are extremely larger and we also eat really fast and do not take any time to enjoy our meal so that we will know when we're full and stop eating, instead we just stuff our faces with food not realizing how much it is, and not just any food, but fast food which is terrible and full of excess fats and other harmful ingredients. I think that the American obesity epidemic is definitely due to our laziness and fast-food addiction. The article that I read from Australia says that the one main reason that America is becoming so obese is the MSG in all of the foods we consume. According to this article, too much MSG makes your body produce three times as much insulin as it normally uses, which eventually makes you gain weight. In an experiment that the article cited, scientists needed a breed of rats that were obese. Since there was no breed that was considered "naturally" obese, scientists simply injected newborn rats with MSG in order to continue their experiment. The article also states that today, food companies are hiding the MSG by calling it other names that sound more natural. It's scary to think this because we don't even know what we are eating half the time. I think that this, combined with America's laziness and fast-food addiction, is what is ultimately making America gain so much weight. According to the article I found, "Five thousand people die of obesity every day in America". This is a serious problem we are facing and there needs to be a way to put an end to it. As portion sizes continue to get larger so do our stomachs. I'd like to go 1 day and eat everything in the proper serving size. Im sure I would be surprised as to how much we are over eating. I think Americans lack knowledge about what kind of food they are consuming. If people were actually aware that the "chicken sandwhich" from Wendys or the "burger" from McDonald's contained products other than a chicken breast and contained filler items they would be less appealed to consume it. I think the best cure to the obesity epidemic is to make Americans aware of what is in the food products we so often buy. Similarly, I think it is dissapointing that it cost so much more money to eat healthy and buy quality products than it is to go through a drive-thru and grab a burger. I think that the world is in fact very aware about the obesity problem in the United States. However, although it seems that everybody looks down on America for being fat and lazy, there must be countries out there who take this as a scientific challenge. This article from Russia says that there might be a connection between fructose (found in many drinks and foods that we eat) and the tendency to overeat. Technology and knowledge is supposed to help us live better lives, yet this isn't the only piece of evidence against our habits. We just can't seem to implement any of the scientific research that our advanced time has done. The world knows the answers, and we've known the answers. The only thing left is for the people to make the change as a whole. I think America has an obesity problem for several reasons. One is a lack of outdoor activities. A lot of people spend many hours watching television, using computers, and playing games. Some kids don't participate in sports often. Another problem is that a lot of the food we eat is made in factories instead of fresh at home. Those foods are called processed foods. Processed foods are often high in sugar and fat. Eating a high fat and high sugar diet could cause someone to become obese. Also, Americans eat a relatively large amount of meals from fast food restaurants. Fast food is often high in fat and calories. Other countries seem to think that we are less healthy, and there is supporting evidence that we are less healthy. I read an article from a British newspaper about how sugary drinks could be a major cause of obesity in the United States. Sugary drinks are high in calories but have little to no nutrients. So I think sugary drinks could be a major cause of obesity in the United States. America is often known for having an extreme amount of obese people. This being because how lazy most americans are. Many find it much easier to go through the drive thru at a fast food restaurant rather than making a homemade meal, completely ignoring how bad fast food is for our health. America is not just lazy, our portion sizes are much bigger than other countries. Because we have bigger portion sizes, we then tend to eat more. Most countries say that America being obese is our own fault. But some people have researched and gone more into depth about learning about America and our obesity and they have found that obesity starts at an early age. Kids are affected by meals served in the cafeteria and by their parents. Kids are provided with meals such as mcdonald and wends and the parents completely forget about the nutritional value. Eating junk food at such an early age can affect the kind of food you eat when you get older. When you grow up eating mcdonalds, the chances of you continuing to eat fast food is higher, because its just what your used to. It is important to feed your kids healthy food and make sure they are getting the right nutrients, by doing this the obesity rate will decrease and America would have a much healthier country. The United States has an obesity problem because we have devolped our country to be a "fast" society, it's not the norm to eat out everyday and different to sit at home and cook your food. It is so much easier to run by a fast food place instead of coming home and cooking which takes a longer amount of time. The rest of the world seems to have a similar thought on our disgusting habits. Most of the world believes that the main problem lies within the food, which is true, but they believe that there are way too many ingredients that are not beneficial. But we must factor in the countries that have such a substancially lower obese rate then us doesn't have to resources to create all these eating establishments or they are forced to walk as their form of transportation, giving them exercise and lowering the health risks. According to "is fat normal" Since the average weight of a person in america is increasing, it's not odd to be a few pounds over, so gradually our weight is increasing but it's supposed to be the norm to be thicker then skinner. In my opinion I think the only reason America has an obesity epidemic is due to the amount of fast food restaurants at every corner of ever street. Just by sitting in the high school I could count about a total of 15 to 20 restaurants that are walking distance from the Coppell High School campus. As the people continue to ingest all the fatty foods and chemicals they start to gain weight, function slowly and eventually routine becomes extremely lazy. It costs more to lose the weight that it cost to gain it. People refuse to work and lose the weight naturally, so they go on pills and drugs which in the future will end up hurting them. For my country of reference I chose the UK specifically England I used the code moderator and my grandmother as resources. In the UK they think that sugary drinks are the biggest cause of America’s obesity epidemic. Even Americans can agree to that and find many ways to justify that reasoning. From what I gathered from research, every other country views the United States as obese. It is obvious that America is one of the most unhealthy nations in the world. America has an obesity epidemic because there is so many places to eat out with in a short distance. On top of unhealthy eating, many are not active and like to sit around with little exercise. Even when people go out to places that are very close by, they will resort to taking a car instead of walking. Things like this contribute to the obesity epidemic. Many countries around the world have this same mindset about America. For example, in an article from Ireland, they believe that we sit around, play video games, and that "everybody's eating poorly." They even go as far to say that we have influence on our pets and that they to are overweight and sit around just like we do. Many of these viewpoints are true as many Americans do tend to sit around and eat very poorly. While everything is so convenient and close, Americans still choose to go to those places in their car instead of walking a short distance. All of these small things contribute to the obesity epidemic in America and many others around the world have this same mindset. I think American culture is to blame for the large number of obese people in our country. The "on the go" lifestyle, has led to individuals eating the quickest choice available: fast food. This, in addition to American's appreciation of a good value have led to fast food being a staple in their diets. Fast food chains are able to keep prices low because of the high volume of customers they receive. These fast food restaurants are in constant competition to lower their prices, leading to the unhealthy preservatives and frozen foods. Eating out on its own is not bad, but the unhealthy fast food restaurants that provide a quick, cheap food options are to blame for the large number of obese people in the country. I believe that America has an obesity epidemic because we are fully aware of what we are really eating and have failed to learn about portion control. Personally, I did not know what was really in food until I got into this class and my health class as well. The fact that a lot of foods have chemicals and materials that aren’t real in order to keep them lasting longer can become a huge problem when trying to be healthy. Other countries know and are aware that our eating lifestyles has gone out of control. We are known for being the fast food country because we just think it is easier to go grab food and go. I feel that plenty of people in our country understand the problem but are used to there lifestyle, therefore they don’t try to change there habits. In the Czech Republic, an article stated that one of the reasons behind American obesity is the fact that the distribution of fast food is becoming easier and faster, causing Americans to have even faster and easier access to unhealthy food all the time. They believe that become of this not only is childhood obesity rising, but adults as well.